Lobster, who doesn’t like (love) lobster? It has this amazing buttery taste that makes you feel like you are eating a royal meal. Most would think it’s high in calories, but actually it is the opposite. These lobster tails have a mere 114 calories and 6% fat, 6% carbs, 88% protein.You cannot beat that for a delicious and nutritious meal. And it’s also so easy and quick to prepare. I enjoy eating different types of “lettuce”, and found some beautiful bib lettuce in the store today. 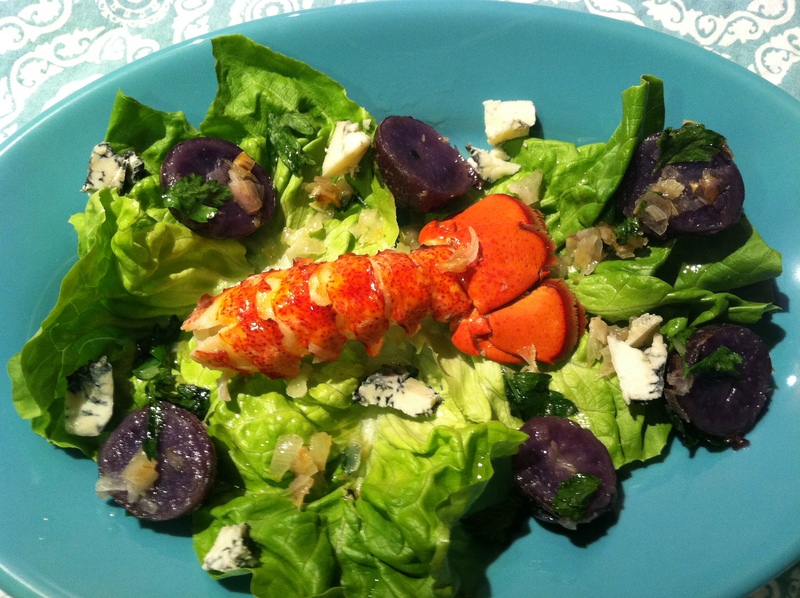 I also felt like having some cheese and thought the flavor of Gorgonzola cheese would compliment the lobster very well. Since I am a huge fan of purple potatoes, I added them to this meal not only for flavor, but for color. Nothing like a plate that has rich, vibrant colors! I hope you try this recipe and share your comments, and as always, Enjoy!! Place washed, whole potatoes in salted water to boil. Cover and once they come to a boil, slightly uncover. Cook until fork tender. About 5 minutes. In a large pot, place about 2 inches of water and add 1/2 teaspoon salt. Add a steam basket on top. Take a wooden skewer and run it inside each lobster tail just under the shell. This will prevent the lobster from curling up while steaming. Place the lobster tails on the steamer and a slice of the lemon and cover. Place over medium low heat. Once the water comes to a boil, set the timer for 7 minutes. When they are done, carefully remove with tongs and place on a working board. There will be some hot water from the steam in the tails, so be careful. Allow to cool for a few minutes until you can handle the tails. Take a scissor and cut along the tail shell until you come to the tail fin. Remove the meat from the shell, leaving the tail on. While the potatoes are boiling and the lobsters are steaming, prepare the butter sauce. Take a small skillet and melt the butter over a medium low heat. Once melted, add the shallots and saute for about 4 minutes. Add the parsley and cook for about 30 seconds. Take the cooked potatoes and slice them in half. Place them into the shallot butter and saute for 2 minutes. Place your lettuce on your plates. Place the lobster tails in the center. Place the potatoes between the two plates and pour the butter sauce over the lobster. Add the cheese.